Can you beat the feeling of a Friday evening! Totally relaxing right? And you can stay even more relaxed as I figure out what you can wear for the next two days making sure you are stylish yet comfortable. The best part is; I’ll use 3 simple basics that most of you will be sure to have handy in your closet. 1. The mid wash slim jean- I’m suggesting a bright cheery chartreuse with a floral print scarf that ties in the blues and green nicely. You will not disagree with me that a well fitted pair of jeans is super versatile. 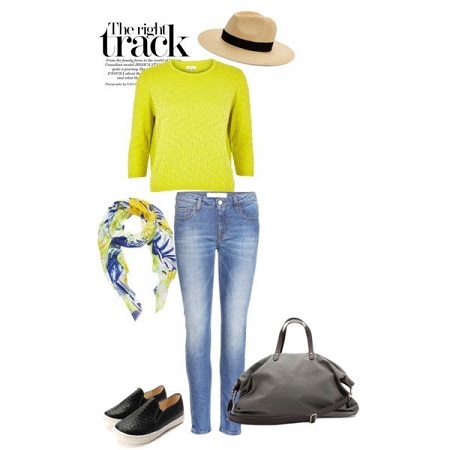 You can use this colour principle with any bright refreshing solid top and a printed scarf to create this look. Wear your slip on sneakers or loafers and pick up your roomy tote for a relaxed day out with girlfriends, a day trip or even just visiting the shops. The Panama hat is a cute addition to keep you shaded and look very chic! 2. 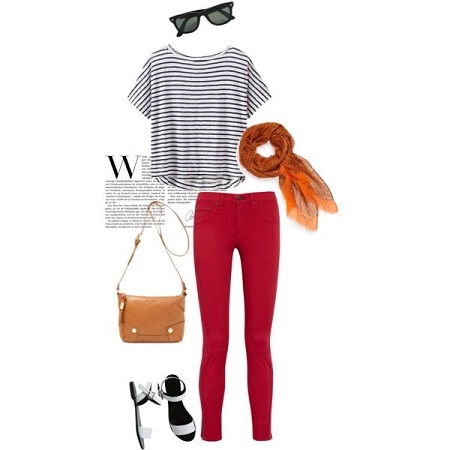 The stripe tee- I can’t stress enough about a stripe tee being an absolute wardrobe essential! Maybe I’m biased but stripes just spell instant style don’t they? I’ve heard that coloured jeans are passe..hmmm maybe. But red is too stunning to give up, it gives the outfit so much mileage when worn well. The warm colour palette of this set keeps it harmonious. A cute silk or light cotton scarf in a delicate print along with white flat sandals makes it holiday chic. Perfect for visiting friends at lunch or taking the kids out to the art gallery maybe? 3. The grey tee – Super cool and classy, a grey tee is a must have in a woman and man’s wardrobe too. Mixing it up with more neutrals can actually be more fun than you think. Khaki shorts, tan tote and black slides put together with the shorts is just perfect for a picnic, the markets or taking a stroll. Its easy to replace the shorts with crop pants or cute utility pants in a khaki shade and throw on a dark grey cardigan if the weather gets cool. Add a long layered necklace in mixed metal and add metallic hair ties to keep the look casual but stylish! I hope you have a wonderful and stylish weekend. Stay tuned for February fun ..coming soon! Like all ideas.super classy.specially first one is my fav.